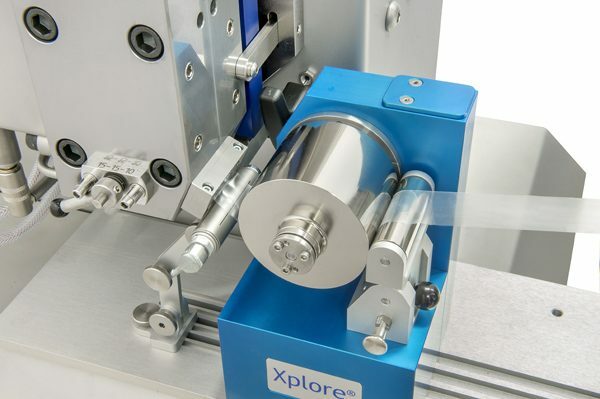 Looking for a small scale, reliable and cost-efficient way to screen your new polymer films? Our CFL 35, CFL 65, CFPL and PFL 50 cast film lines produce flawless cast films from only a few grams of material. Fully compatible with our micro compounders, they are particularly beneficial when only small amounts of material are available or when using expensive polymers or additives. Many R&D facilities use our micro cast film line devices to reduce their screening costs and accelerate their R&D processes. Faster film production. Representative film is obtained within a few minutes to speed your screening workflow. Smaller samples. Compared to conventional film development, only a fraction of material is used therefore ideal for new formulations, active pharmaceutical ingredients, etc..
Ultra thin, ultra wide, ultra long. Process films up to 65 mm wide using our air knife, down to 5 µm thick and with extreme lengths to meet your test requirements. Additional calender(s) for slip free film transport. Customized solutions to meet specific requirements.